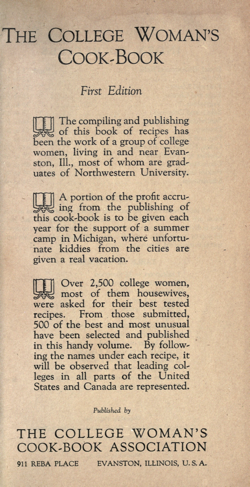 The compiling and publishing f this book of recipes has been the work of a group of college women, living in and near Evanston, 111., most of whom are graduates of Northwestern University. A portion of the profit accruing from the publishing of this cook-book is to be given each year for the support of a summer camp in Michigan, where unfortunate kiddies from the cities are given a real vacation. 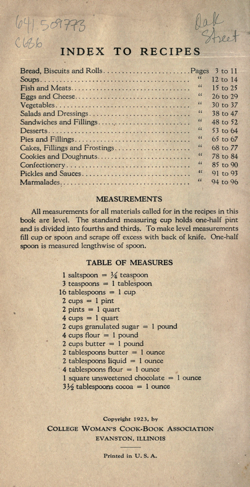 Over 2,500 college women, most of them housewives, were asked for their best tested recipes. From those submitted, 500 of the best and most unusual have been selected and published in this handy volume. By following the names under each recipe, it will be observed that leading colleges in all parts of the United States and Canada are represented. Sift three times. Rub in four rounding tablespoons butter with tips of fingers. Add two eggs beaten (reserving small amount of unbeaten white) with one-third cup sweet milk. Toss, on floured board and pat to one-half inch thickness. Brush over with egg white; sprinkle with sugar; cut and bake fifteen minutes in quick overi. Helen Binnie, Kenosha, Wis. University of Wisconsin. Publisher Evanston, Il. : College Woman’s Cook Book Assoc.